Decisions involving everything from personal relationships to careers to the Presidential election carry greater significance as 2016 — the Year of the Monkey — swings into high gear. While the Monkey exudes energy and confidence, we must “outsmart the clever Monkey,” advises Master Tsai, who provides information and Asian astrological advice through his website, mastertsai.com. As early as 533 BC, depictions of the 12 animals representing the 12 years in the zodiac cycle appeared in tomb-ceiling paintings in China. The concept gained popularity in Japan during the Edo period (1603-1867), according to Asian and Japanese studies scholar Mark Schumacher of onmarkproductions.com. Depending on a person’s birth year, it is believed that they take on the traits of the animal for which that year is named. For example, people born in the year of the Monkey (1920, 1932, 1944, 1956, 1968, 1980, 1992, 2004) are said to be quick, charming, smart, and competitive much like simians in the wild. Famous entertainers born in Monkey years include Johnny Cash, Mel Gibson, Tom Hanks, Hugh Jackman, Will Smith, Mylie Cyrus, Jerry Springer, Danny DeVito, and reality star Kim Kardashian. In the race for the Republican presidential nomination, both Donald Trump and U.S. Sen. Ted Cruz are were born in the Year of the Dog—1946 and 1970, respectively. Sen. Marco Rubio was born in 1971, Year of the Boar. Democratic candidate Hillary Clinton was also born in a Boar year (1947), while her competitor Sen. Bernie Sanders and former Florida Gov. Jeb Bush were both born in Snake years. When one’s Zodiac sign is the same as the current year, men are referred to as toshi otoko, and women are called toshi onna. Rats and Monkeys complement each other and have similar traits. 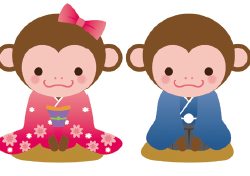 The Monkey year can energize the Rat and keep him busy while also providing opportunities for financial gains, knowledge, health, and for developing relationship skills. The Rat will likely gain more confidence this year as well. Rat-year people who are looking for job advancement or seeking to change careers may find support among co-workers. Rats are advised to take a class and learn a new skill. If you are single, this is also a good year to find that special someone. The Rat is compatible with Dragon, Monkey and Ox and should stay away from Horse, Rabbit, Rooster, and Sheep. Ox-year people tend to be calm, patient, methodical, and have a strong sense of responsibility. They seek stability and comfort and are conservative, but can also be stubborn and slow to act. This is in stark contrast to the Monkey, who is active and impulsive. During a Monkey year, the Ox may be more willing to take initiative, speak up and socialize. This could also mean more career development opportunities as well. 2016 will be a good year to build your social networks and contacts. Those who have been thinking about making a career change should might find that the timing is right. Ox-year folks will earn money through hard work and by using their brains. Ox are compatible with Rat, Rooster, and Snake but not with Dog, Dragon, Horse, or Sheep. Tiger-born people are proud, strong, and dominant. Tigers often seek to fight the Monkey, which could result in a challenging year because it is possible that the quick, artful Monkey will outsmart the Tiger. 2016 will be a good year for seeking further education and building professional skills, but it is not an opportune time for a job change. In personal relationships, keep a low profile and remain calm if there is a conflict. Tigers are also advised to be cautious when it comes to investments. Tigers get along with Dogs and Horses but not Monkeys or Snakes. Rabbit-people are excellent communicators and good listeners. They are gentle and loving and are often trusted friends. Those born in Rabbit years also maintain a nice outward appearance. They can also be very ambitious but rarely make a move without first carefully weighing all of the options. Those who change jobs will be able to build a good relationship with the new boss or partner. 2016 will generally be rewarding, and love relationships will remain strong. Dog, Boar and Sheep are compatible with the Rabbit. Avoid Dragon, Horse, Rat and Rooster. The Dragon is a symbol of power and ambition. People born in the Year of the Dragon are natural leaders who are always willing to help others but rarely ask for help. Although they prefer solitude at times, they can also be outgoing in social situations. 2016 will bring prosperity and maybe even unexpected income. Dragon-folks will meet many new people. Those who are single could find a new love relationship, while those who are already in a relationship may see it grow stronger. Dragons should exercise and pay attention to their diets. They are most compatible with the Rat, Monkey, and Rooster. Those born in the Year of the Snake are intelligent, graceful, and methodical. They like luxury and are adept at getting the things that they want. They will use deception and manipulation to get what they want. At home, they prefer serenity and can become easily stressed. Many Snakes change jobs frequently but are diligent workers. Good luck awaits them in both money and career. Snake-year people should try not to over-exercise as it may lead to injury. Ox and Rooster are compatible with the Snake, and Boar, Monkey, and Tiger should be avoided. An exciting year ahead is predicted for those born in the Year of the Horse. Extremely intelligent, Horses are strong, friendly, have a well-honed sense of humor, and enjoy being the center of attention. They often chase success, fame and wealth. They are vain and love to win, but have been known to throw tantrums when things don’t go their way. At work, the Horse-person’s workload and responsibility will increase, and there will be a promotion opportunity. A job offer may even come from another company and ought to be considered. Dog, Sheep and Tiger are best with the Horse, but not Ox, Rabbit or Rat or another Horse. Individuals born in the Year of the Sheep prefer repetition and predictability. They are often timid, maintain a few close friends, and are selective about whom they allow into their inner circle. They are family-oriented and make excellent spouses. Where work is concerned, Sheep are very adaptable and can successfully complete almost any task. A career opportunity is coming, and Sheep-year people may want to consider accepting the challenge. In their personal relationships, Sheep people should remember to respect the opinions and feelings of others. Horse, Boar, and Rabbit are good matches, while Dog, Ox, and Rat are not. Monkeys are the pranksters of the zodiac. They are curious and mischievous, intelligent, and creative. They prefer to be in control. Monkey-year people are also ambitious and like to show off. They work quickly and are skilled at many tasks. In their personal lives, they are easily bored and will not settle down until they find the right mate. 2016 will be a dynamic year for them, albeit a bit unstable. This is the Year of the Red Fire Monkey, the most aggressive of all the Monkey years and also the most charismatic. Dragons and Rats are the best matches for Monkeys, while Snakes, Boars, and Tigers are less compatible. The Rooster pursues perfection, romance, and beauty. Individuals born in the Year of the Rooster are hard-working, witty, thoughtful and brave. They are also egotistical, opinionated, and proud. Rooster-year people are cautioned against investing as it will not be a good year for seeking wealth. However, social activities will increase. Spend more time with close friends and family. Roosters are compatible with the Dragon, Ox, and Snake, and least compatible with the Rabbit, Rat, Dog, and another Rooster. Just as the Dog has good sense of smell, an individual born in the Year of the Dog can sense when something is wrong. Dog-people are alert and vigilant, loyal, and brave, and are known to make correct decisions based on circumstances. On the other hand, the Dog can be head-strong, cold, and judgmental. Career-wise, things will remain stable for Dog-year people in 2016, and they will find ideal partners to advise them. Financial prospects look promising. Dogs are compatible with Horses, Rabbits, and Tigers and should avoid Dragons, Oxen, Roosters, and Sheep. Those born in the Year of the Boar are knowledgeable, understanding, trusting, composed, and persistent. However, their trusting nature can also make them gullible. They are also self-indulgent and judgmental. In their careers, they should try to avoid becoming complacent or arrogant. Financial picture will continue to be good for Boar-people, who should remember to stay humble. Boars get along well with Rabbits and Sheep but not with Monkeys, Snakes, or other Boars.